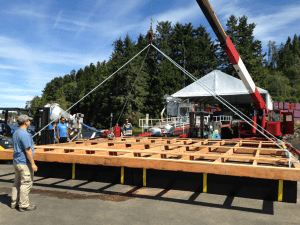 KEDC leads and operates two main projects in its fisheries department: an Offshore Aquaculture Pilot Project to grow scallops and oysters and a Cold Storage Facility for fishers on the North Island. To follow the development of this project, read more of our updates! In 2015, KEDC launched its first aquaculture pilot project focusing on scallops and oysters offshore in the Gwa’sala ‘Nakwaxda’xw tradional territory. The project provides both a sustainable economic development opportunity for the Gwa’sala ‘Nakwaxda’xw Nations and a potential means of livelihood for community members wishing to live semi-independently in our traditional homelands. 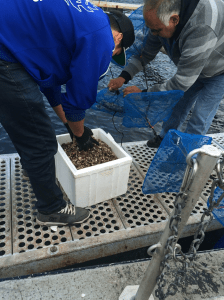 The goal of this pilot project is to explore the feasibility of growing Pacific scallops and oysters to market size in a condensed period of time of two summer seasons, relying on rich and pristine waters offshore to supplement and promote optimal growth rates of the species. The first major milestone was stocking the site with scallops and oysters as two of the project’s candidate species for market. In the spring of 2016, the program will stock to full capacity and undertake regular maintenance and monitoring to ensure the product is meeting its full potential. 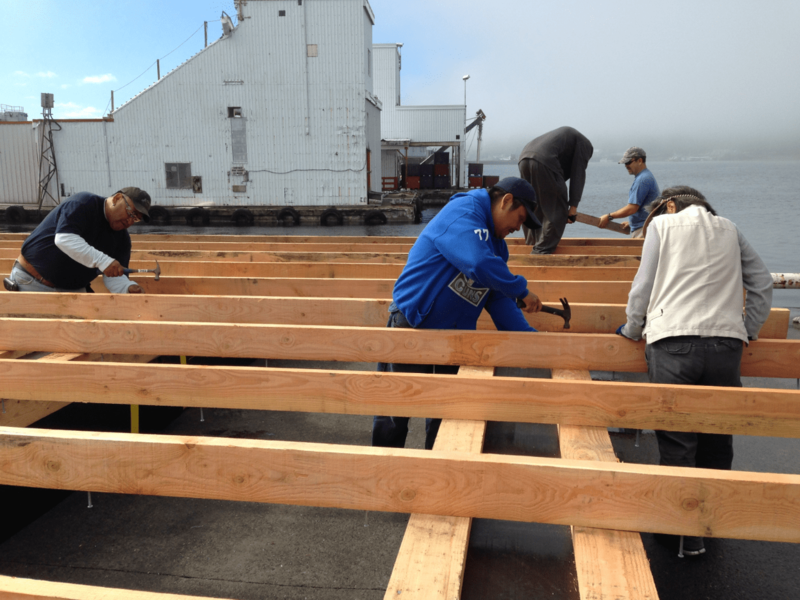 Hired community members build a raft at the Canfisco site in Port Hardy, which will be used to hang nets and trays to grow shellfish. David Schmidt of the Lands & Resources Office and crew lift the raft into the water. 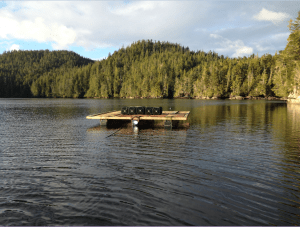 The raft being used for this pilot project has an efficient, compact design which fosters the growth of shellfish in waters off Port Hardy. Community members Ernie Henderson and Moses Walkus sort oyster seed to put into the blue pearl nets, where they’ll stay until they grow big enough to go into the trays. KEDC’s new cold storage facility boasts of a capacity of 2.2 million pounds, blast freezers and a 2,000 square foot fish processing facility. 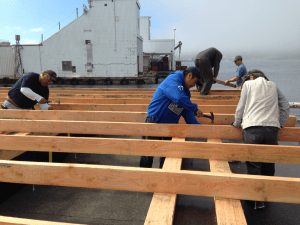 The Cold Storage Facility has been made possible through the financial support of Coast Opportunity Funds, who has been at the forefront of many costal community success stories, and through financing provided by CIBC. 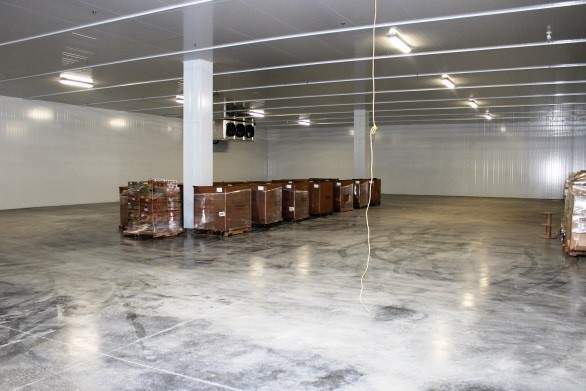 If you are interested in freezer space, please email Albert Charlie, Shipper and Receiver for KEDC’s cold storage facility, at albert@kedc.ca. The space is open to residents and visitors of the North Island.